Cultivate caring relationships with creators. Consider the ergonomics, health impact and accessibility of your workplace. Decorate the shop space so it is fresh and alive. Respect and maintain tools and software. Know where products are made and by whom. Understand frustrations and complaints can bring opportunities to create better systems. Understand that your business is an ecosystem and is part of a wider ecosystem. Choose and curate stock mindfully and intentionally. Never argue with an artist about their prices. Never argue with a customer about your prices. Respect the art you sell and be accountable to your role in selling and profiting from it. Design policies/systems that are simple and easy to understand and use; practice explaining policies/systems; if it’s hard to explain, ask why. Listen to your intuition; listen to your body. Listen to staff, listen to customers, listen to creators, listen to partners. Do what you say you are going to do; and don’t make promises you can’t or don’t want to keep. Know and respect the bodies at work throughout the entire supply chain including those you’ll never see. Learn about the entire life-cycle of packaging and other ‘disposables’. Know the products, know what they are, know who created them, know why you stock them. Create clear and consistent policies that are easy to follow and make sense for everybody in the ecosystem. Ensure systems and schedules can work around sick days, periods, other body cycles that may require rest/time off. Create systems that do not require team to choose between their bodies’ needs and earning a living. Allow staff to step into, own, and develop their roles. Tend plants as a priority, not an afterthought. Centre joy and ease in all systems (especially the most mundane). Make it fun; find creative outlets in the work; joy is a perfectly good reason! Be yourself, use your own voice. Remain human and in your body. Pee when you need to pee. Eat when you need to eat. Acknowledge fear, bring worries into the open to share and tackle together. Acknowledge and discuss problems and look for sustainable solutions. Understand that an assistant contributes as much as a manager in terms of making this work. Practice gratitude every day and in every interaction. Seek out, stock and promote the creations of marginalised people and emerging artists. Don’t compete with artists. Don’t compete with anyone. Provide helpful, honest information to customers to help them make more intentional, mindful choices. Automate repetitive tasks so the valuable resource of staff time and energy is focused on human service. Remember that everybody including you is a whole complex human being who yearns to belong. Keep staff structures simple and lines of communication clear. Price goods so that everybody can be paid enough. Pay good and sustainable wages; pay on time. Seek local partners, materials and resources and spend money in the local economy. Factor in time for maintenance, cleaning and domestic work and value this work as an essential part of the shop. Provide music, radio and podcasts if/when wanted. Look for the root problem beneath the surface problem; ask: what is this problem really about? Ensure your website is fully accessible. Share systems among team; no hidden knowledge, so we can help each other, cover absence, or grow into new roles. Manage customer expectations clearly and fairly. Honour a customer’s purchase; decorate packages, include a friendly note, take time to handle and present items with love and care. Make time for reflection; be ready to adapt and revise systems to accommodate new wisdom. Cultivate abundance consciousness; notice where you feel scarcity or poverty and question why this is and how it affects the shop. Allow plenty of time for tasks to be completed. Avoid rushing. Avoid future rushing by setting realistic goals and expectations at the outset. Cultivate an intuitive understanding of when and how to apologise. Have a clear and simple pricing policy that can be explained to team, customers and creators without shame. Talk about the shop’s values regularly and ensure the whole team is familiar and on board with them. Invest profit in emerging artists and creators. Share behind-the-scenes stories, share the humanity of the business. Rethink ‘efficiency’; value humanity and ease over cold hard speed. Include surprise touches when it feels good. Listen to our bodies; don’t do it if it hurts or feels wrong. Question and reduce use of toxic chemicals. Discuss racism, homophobia, transphobia and other forms of oppression and be honest about how these show up in different areas of the business. Cultivate an awareness of social capital and power dynamics between team/creators/customers/partners, and their impact in relationships and transactions. Encourage eye contact and other forms of consensual contact; know that you are in community. Allow people to change, any and every moment. Don’t assume anything about anybody, stop judging. Ask people’s pronouns; share our pronouns. Ask questions; it’s okay not to know something. Ask for help when you need it; recognise the generosity in reaching out. Think holistically; look for the feeling beneath the surface issue. Share processes with customers so they can see how things work and why things take the time they take. Find creative ways to honour and use damaged stock and returns. Provide a holistic service and honour transactions. Understand communication as relational not just transactional. Understand that stocking an artist’s work is an act of collaboration. Acknowledge and respect that the earth provides all resources. Reduce unnecessary consumption, reuse what has use left in it, recycle waste, acknowledge landfill and work to eliminate it. Openly honour natural cycles, the moon, the seasons. Empower customers by providing the tools/information to handle simple issues/questions for themselves. Advocate for artists and small businesses whose work you believe in. Pay invoices and bills on time. Recognise how money flows in, out and through the shop and talk about this openly. Collaborate with and spend money with businesses who share our values. Lineage: Jennifer Armbrust of Sister.is created a writing called ‘100 ways to make more money’. My partner Emma, studying in Jennifer’s Feminist Business School, riffed on this to write ‘100 ways to make a feminist building site’. 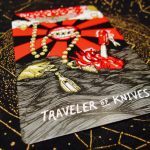 I riffed on Emma’s piece to write something that felt specific to my own business, the Little Red Tarot Shop. 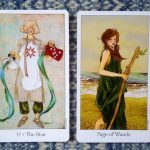 A three-card spread to explore the qualities and perspectives the Slow Holler Tarot can bring to tarot readings. It’s such a simple and stark reminder to me of how I have fallen for the ‘disposable bodies’ message of capitalism. How I ignore the needs of my body for (faux, unsustainable) productivity.